Welcome to my big slot wins.These are some of my tips and tricks on how to actually win more often playing slot machines.You can’t beat slot machines, but there are different ways to play slots. I absolutely love playing at the casino every day. I absolutely love gambling but like most hate losing.Lets make gambling more fun, exciting and profitable.Here are some different ways to play slots and increase your chances of winning more money.With my gambling techniques, I am able to play slots every day at the casino.To see my latest slot wins check out my twitter feed.I post new pictures of my big slot wins almost every day on twitter. This hit is the best hit ever on a quarter slot machine.This slot game is galled the penguin pays slot by Aristocrat.I have had a few good hits on this slot machine a few times,but nothing like this.Betting only one line with a five times multiplier and wow.This has to be one of the biggest hits ever on the penguin pays.Betting only one line playing quarters and it actually hits huge.This penguin pays feature hits the bears 6 times for $7,500 by far one of the best slot wins ever.I love the challenge of hitting long shot bets. This is my story on playing slots to win more often.After years of playing random machines I discovered some different ways to play slot machines that increased my chances of winning actual cash.I share all kinds of big slot wins from my phone,and some pictures didn’t turn out so well.Instead of always trying for the big slot win, sometimes my goal is to keep my loses to a minimum on slots. I found one of the best ways to play a slot machine is to play less lines with a higher multiplier. There are some machines that allow you to play one line at 10 or 20 times fer line.The buffalo is one of the best examples of this type of betting.Betting one line times 10 paid me $55 dollars on the buffalo last night. 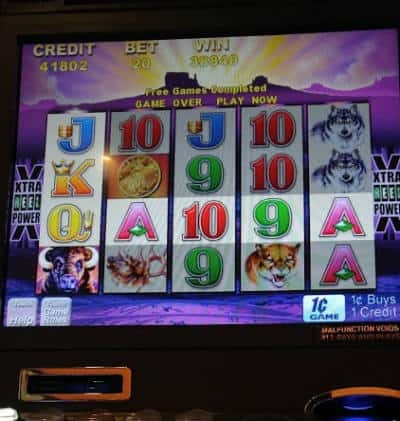 Here is another slot machine I like to play called winter wolf.I play for the major jackpots when the get above $450.This was one of my big slot wins on the winter wolf.I usually play Aristrocrat ,WMS games sometimes I play bally machines.I prefer to play slot machines where I can choose how many lines etc. These are some of the best wins I have had on slot machines at the casino.This was my big hit on wicked winnings at the casino for $3,306.00. 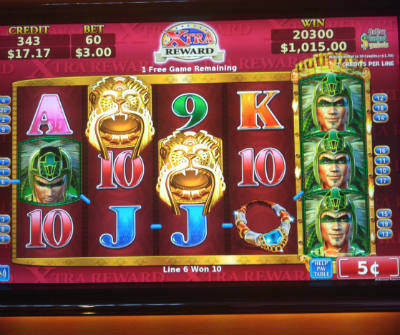 I was betting $2 dollars and maybe only played the slot machine for 15 minutes.Wicked winnings is a hard slot machine to win on, but when you do it can be huge.I have seen people actually win over $2,000 just betting 50 cents on rare occasions. I have been winning big on small bets more often.I have found one of the best ways to win on slots is change the way I bet.Here is a big win on a buffalo slot machine where I only played 10 lines instead of playing all 40 lines.I ended up winning over $700 on the free games.This buffalo slot machine hit on a .50 cent bet.This is one of the best aristocrat slot machines I have played. Here are some of my biggest slot wins ever.This pictures is from a slot machine called Mayan chief.Playing max for only a few spins actually paid off this time.I rarely bet the max on a slot machine,the odd time I will try maybe 4 spins at the most.This slot machine could have paid so much more during the free games. 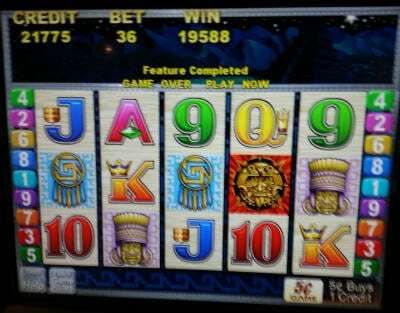 I go to the casino every week sometimes every second day.My recent big slot wins I post on twitter.I take all my pictures with my phone so some pictures don’t turn out that great.I have to edit the image also before I post it on here.Here is another great hit for over $1,500 on the Mayan chief slot machine for only a dollar bet. I usually test out the new slot machines at the casino.New slot machines can be fun,but they can be terrible for payouts.The casinos today can be fun and exciting,not like the movie Casino.I generally try to play less lines with higher bets per line for big wins.Here is a slot game called panda paradise with sticky stacks during the feature and I won over $50 betting only 25 cents. I like playing a game called the sun and moon by Aristocrat.The sun and moon game can be a great slot machine.I have found that playing the sun and moon with only 5 lines is usually not a bad bet.Here is a picture of a great win on the sun and moon for just under $1,000.The picture is a little out of focus but it shows how much I won.The game hit 50 free spins 3 times and paid out $1,000. Some of my best casino slot wins have come on weird bets.If the game has 50 lines I will play something like 10 lines.Some of big wins have come from a game called crystal fox while playing less lines.The casino I visit has a nickel version of crystal fox which I have won $500 over 20 different times.I share most of my casino slot wins on here. One of the best slot machines I have played is called crystal fox.I have had several big slot wins on the crystal fox.I also play the quarter version of this game and won $3,500 on one feature.Most times I will play only 5 lines on the crystal fox.The picture above is from another night where I won just over $1,000 on the crystal fox.I even won good playing only 3 lines on this slot. 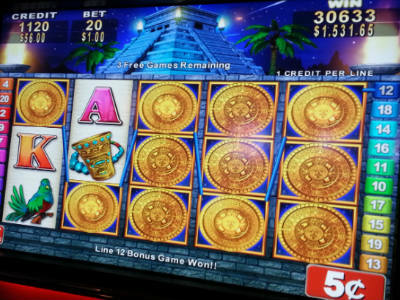 I sometimes will play a game like Wild Aztec slot and have a big slot win.This picture is from when I decided to try a few spins betting $3.I only played the machine for maybe 5 minutes and hit the free games.As you can see I had a big hit for $1,000 on my free spins.I generally lose a quick 20 dollars or so playing games like this.This time I got lucky and won on the wild Aztec. 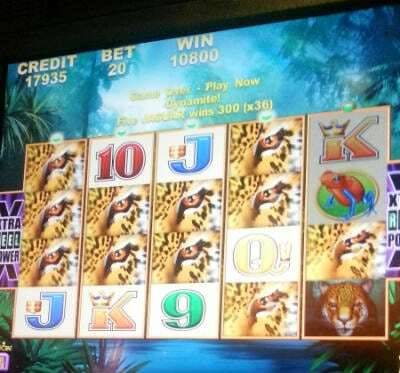 Here is another big slot win on a game called the jaguar mist, which is just like the buffalo slot machine.I have had several big hits on this game when betting small.There are 40 lines on this game also,but I rarely play all 40 lines.The jaguar mist slot machine can pay out decent amounts on small bets.Playing only 20 cents also gives you more play time on the slots. We all want to have big casino wins when we play the slots.The way I play the slots at the casino may work for you also.Most times I go to the casino with a limited amount of money.I usually will play the first few slot machines betting small amounts.If I don’t hit anything within the first 5 or 10 dollars I move on to the next machine.Playing several machines will always increase my chances of having a big win at the casino. Here I had a big buffalo slot win on a small bet.I was betting only 1 line times 20.For only 20 cents this was a huge slot win on the buffalo free games.The best way to play the buffalo slot is with a nigher multiplier.This feature on the buffalo paid me almost $400 on a 20 cent bet.I also put up a video on YouTube here.Once again this proves you can have big slot wins betting small amounts. There is another new slot manufacturer called Everi which has several new games one I play is called Money Frog. I actually don’t like this slot machine and rarely play it.This game is made by Konami and can pay out big on rare occasions.I decided to give it a few spins on a big bet.I got lucky here and hit the free games feature.The feature hit for over $1,300 which was a huge slot win on the Jumpin Jalapenos game.The casino I play at has several penny versions and a few nickle slot machines. I like playing certain slot machines that have major progressives.This slot machine game is called vampires embrace and the major progressive has to pay out before $500.After winning the major progressive on this slot I ended up with over $1,500 cash.I have had several big slot wins on games like the vampires embrace.After any big or small win,you can also trigger the minor or major progressive jackpots.People play only 20 lines and win the major progressive sometimes on this slot,my turns coming. The crystal fox slot machine has been one of my all time favorite slots.This picture is from the quarter version of crystal fox betting 3 lines times 3.Betting only 3 lines on this slot paid off with a huge slot win of $3,700 during the feature.I have had several big wins on this slot,but this was the best win so far.I have also had several good slot wins betting only 1 line on the crystal fox slot. Here is another great big win on the buffalo slot machine for over $1,700.The buffalo slot can pay big without a feature.This was a bigger $2 bet on the buffalo that hit a bunch of buffalo and paid big.I like playing smaller bets usually on the buffalo slot.Sometimes if you want bigger slot wins at the casino you have to bet bigger.I generally have better luck winning on the buffalo features. Here is a small bet I have been trying for awhile now on the crystal fox slot machine.This is a huge hit for only betting 5 cents.I only play one line on this slot and finally hit for $250 on the feature.The crystal fox slot can pay big during the feature even on small bets.I have never hit all the dollar signs with a 10 times multiplier,but here I managed to hit a 5 times.This is one of the best hits on the crystal fox I have seen. Sometimes I walk around to see if there are any slot machine big winners.The casino I go to only announces slot wins if they are over $5,000.Some nights I don’t hear of anyone winning on slot for hours.If the casino is busy they can be several big winners on slots.The people betting high on dollar slots win 5,000 often but they also bet $45 a spin on slots. This is one of the newer dollar slot machines called the enforcer.This slot hit a feature and won over $1,800 for a 5 dollar bet.I try dollar slot machines sometimes for a few spins.This was a huge slot win on the enforcer.The feature kept hitting extra free games and paid big. I have some big wins at the casino,usually playing slot machines.Slot machines are more fun than card games.I have also seen more big wins at the casino on slots.In order to have a big win at the casino playing cards,you have to play for a long time and bet hundreds.I usually go for the smaller wins on slot machines nowadays. I also try to share my recent big slot wins at the casino on twitter and YouTube as well.